Above is the main menu of Rogue Legacy, as viewed when playing with an XBox 360 Controller. 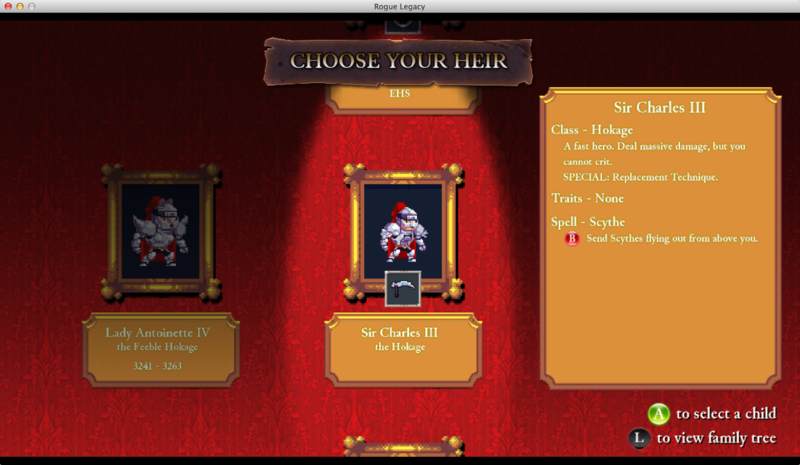 It features a good call to action with the giant “Choose Your Heir” text and green “A” button. So that’s good, you definitely know where to start. But while there is an option to view the game’s credits, nowhere on the screen is there any indication of how to quit. Instead, it’s buried in the options (the gear) menu. I’m thinking that putting quit in your settings menu isn’t a pattern that you probably want to follow just yet. Making it even worse, the quit option doesn’t stand out from the rest of the menu. It looks exactly the same as everything else, making it really easy to miss. I definitely opened this page multiple times before actually noticing the “Quit Rogue Legacy” option at the bottom. It’s all about prioritizing your actions based on what users really do. And eventually, I hate to break it to you, the users will want to quit your app or game (unless you’re Facebook, I suppose). So you may as well make it easy to find. If you’re trying to trap users by hiding the quit button, you’re doing it wrong. Also, I appreciate the fact that as a game designer, you want to be known for your work. By all means, I’m all about it. However, if you’re designing for your users, I’m sure they would rather have a “quit this game” action on the title screen more than one to view the credits. This entry was posted in Action, PC by mark d. Bookmark the permalink. I’m curious. Since their menu uses controller buttons to access each section, what controller button would you have the player press if the “quit” option was up-front? B, followed by a confirmation screen? I have a feeling they actually had forgotten to put the option, and the quick fix was to add it in that menu, maybe (wrongly) assuming that most people would alt+f4 their way out?